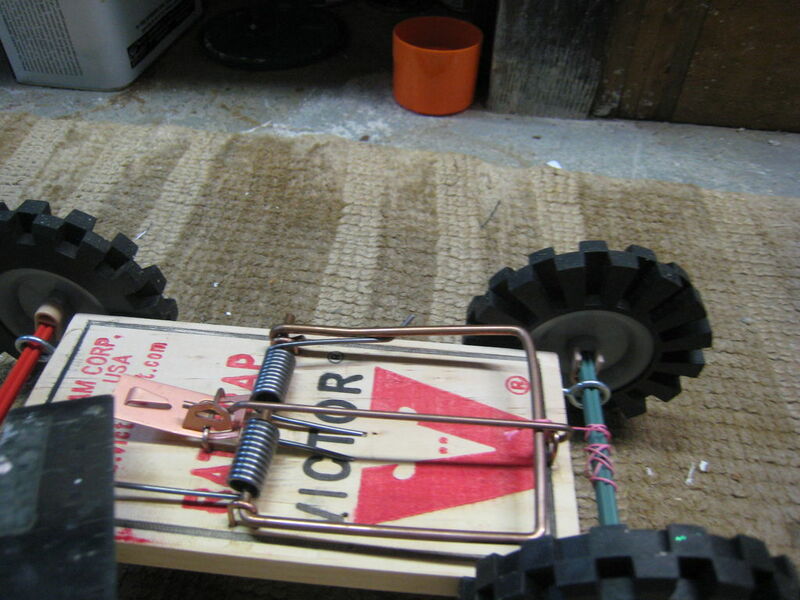 This project was inspired by LarrySDonald's Mouse Trap Car. I give him full credit for the idea. Anyway, this is a very similar thing except with a twist. My car is made with a rat trap instead of a mouse trap. I had some knex lying around and I thought that they could make great wheels and axles. This car goes pretty far and fast so be careful. You also need to be careful of the rat trap because it is on a hair trigger and can release at any moment. I take no responsibility of damage to any property, body parts or animals hehe. Make sure nobody is in the path of the car when it is being launched. Drill two holes using the 5/64 drill bit on the 1/2 inch marks you made on both sides. Now its time to make the front axle. Get one of the red rods and put one grey connecter on the end. Next slide one of the wheels on and snap in a tan connector behind the wheel slide this into the whole to lock the wheel to the rod. Now slide the axle through on of the eye hooks on the front end (the end with the bar down when not in use) Next put the other end of the rod (the one without the wheel) through the next eye hook. Put the second wheel on using the method above. Now your done with the front axle. The rear axle is the same as the front but the rod needs a hole driled through it. Use your 1/64 drill bit. Now get your fishing line and measure out ten inches and cut with your scissors and burn the end with the lighter. Tie one end of the line onto the main arm of the trap. You should have about 9 inches of line on the other end. First you need to put the long end of the string through the whole drilled in the knex rod. Next, spin the rod backwards (on the trap there is a rat, the rat's nose is pointing in the direction you want to spin the rod in). When the string is taught and you cannot turn it anymore without pulling back the arm, pull the arm back and spin the rod again until you have used all the string. Now arm the trap as you regularly would. To trigger the trap get a long object like a ruler or something and tap it and quickly pull away. Hello, did you find the knex wheels, gray connectors, tan connectors, and the length rods? Dear bakenbitz, I have to do a project in physics where we have to make a homemade car that has to go up a 23 degree ramp without using chemicals or electricity. I thought this car would work, but I'm just wondering, do you think it will be able to go up the ramp? where did you get the knex items from?? throw a rat at it to start it hehe. I've found it to work even better if you use a broken rubber band instead of a string. where do you find knex wheels?